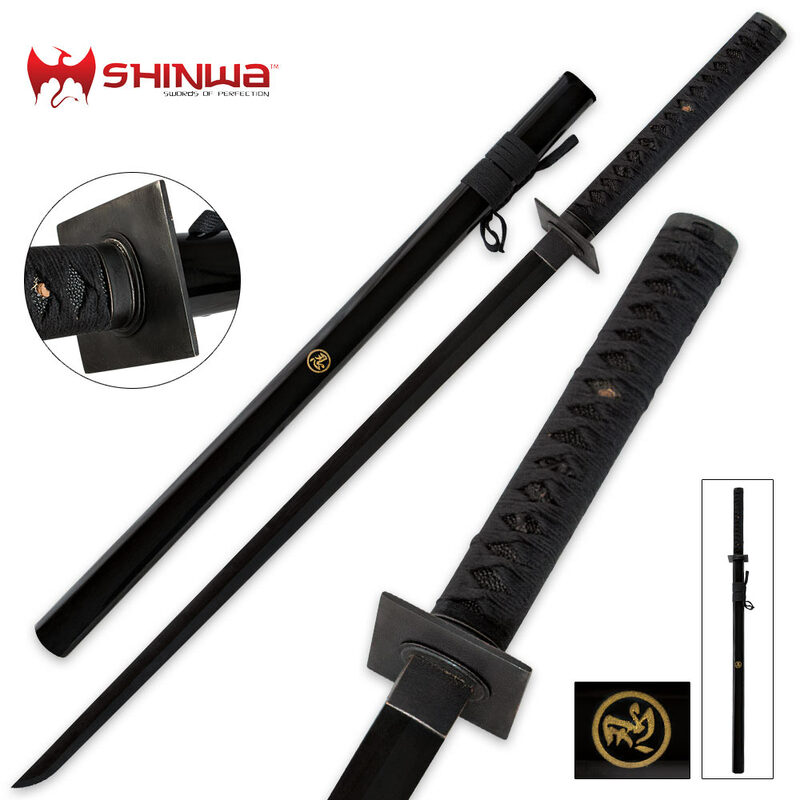 Shinwa Full Tang Fighting Ninja Katana Sword | BUDK.com - Knives & Swords At The Lowest Prices! 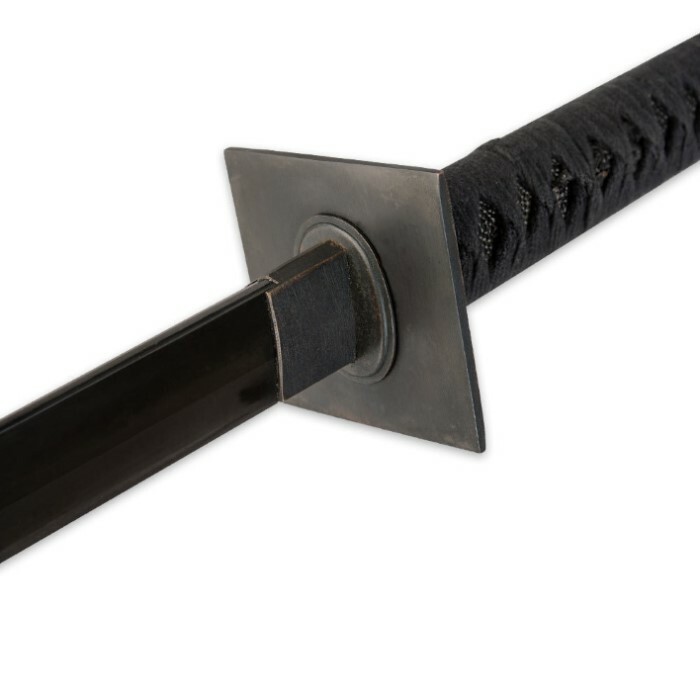 No ninja sword collection is complete without the addition of this brand new full-tang Fighting Ninja katana from Shinwa. This masterpiece features a 28-3/4" heat-tempered 1045 carbon steel blade that has been handmade and sharpened by artisan sword smiths. Details abound, including a cast iron tsuba and antique-finished zinc alloy habaki, menuki and pommel. The handle is encased in faux ray skin and wrapped with decorative cords, and a lacquered hardwood scabbard houses the blade in traditional style. I just received my new swords, and I was truly amazed. My new weapons are really outstanding. They are not as sharp as I would have liked them to be. I will have to work on them to get them to the sharpness I would like to see. Overall I am satisfied with the quality of the swords. I am also a first time buyer from True Swords and I'm totally impressed with the way they have served me with my choices of weapons. Thank you True Swords for all your hard work in trying to please your customers. Just received it today. Beautiful sword. Very sharp and everything is tight. For the price you can't beat it. Very pleased! When the aliens come to take the planet stealth will be the key to winning the war. This sword will help win that war on a cheap budget. It is nicely made and will definitely remove the arm or head of a grey lurking on your premises. Got this for my grandson he's gonna love it! Good strong katana full tang sharp great deal for his first sword" and to learn or for show I'm very impressed everything good and tight very pleased thanks" BUDK For another great deal! You can't go wrong with a Shinwa! This Ninja-To is a true Ninja-To of 1980's . Like all of the great Ninja movies . This is a sword for all real modern day Shinobi and Ninja collectors . Buy it today before they are gone . Ballance and feel are amazing. Definitely worth twice the price. I got this sword as an early present from my wife. I love this sword. I got it today and when it came I was very excited. This is an awesome sword. It came on time and perfect. I also practiced with it too. I highly recommend shinwa and true swords they are awesome. For the price of $39 it's a nice display piece but I'm not impressed with Shinwa and this will be the last sword I will buy of theirs. Edge rolled when I hit the card board box it came in, it's about as sharp as a butter knife and as heavy as a sledge hammer compared to other functional swords I have. I will stick to Musha and Musashi swords as they are of much better quality and are usually less expensive. Other reviews have to be exaggerated as to the sharpness and now I know why it is only $39.